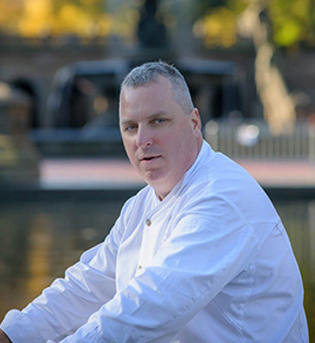 New Jersey native John Greeley brings a unique perspective as a chef and artist to his position as the new Executive Chef at the Central Park Boathouse. Greeley’s American Cuisine has both coastal and southern influence and relies heavily on locally grown produce. Trained as a painter and sculptor, Greeley uses his creative talents to craft dishes that highlight seasonal ingredients with an artistic visual flair. Greeley’s culinary interest started as a teenager while experimenting on his own in his family’s kitchen. As far back as I can remember I was interested in food and cooking. Not just the process and creativity of cooking but ingredients. There is a true sense of discovery when working with something new or unusual. New Jersey farms and ingredients from the family’s garden were an important part of family meals while he was growing up in Ridgewood, New Jersey. He spent his summers cooking in Nantucket and Rhode Island and credits this time by the ocean for his love of surf, seafood and fishing. His passion and talent for the Fine Arts led Greeley to New York’s School of Visual Arts where he spent two years before transferring to the Savannah College of Art and Design in Savannah, Georgia, where he received his BFA. During that time, he was also working as a sous chef at Gerry Klaskala’s restaurant in Savannah’s historic district, 45 South. There, he quickly gained an expertise in Southern gastronomy, especially the then emerging Low Country Cuisine. After graduation, Greeley began working at New York City landmark ’21’ under Chef Michael Lomonaco. He was quickly promoted to sous chef and later was named opening chef de cuisine of Upstairs at ‘21’, an intimate dining room one flight above the famous Bar Room. In 2007, he became top toque at ‘21,’ elevating the restaurant’s iconic dishes by seeking out the best ingredients possible and preparing them through the eyes of an artist. A self-trained cook, Greeley has also staged at several top restaurants in New York City, including the four-star Per Se. He has also continued to pursue numerous culinary adventures abroad, including his time presiding over a cooking school at the luxurious Villa San Michele in Tuscany. To this day, Greeley always imagines and develops dishes on paper before testing them out and uses the sketches as a tool to educate his cooks. His paintings and sculptures, which include cityscapes and still life’s, have been exhibited in galleries in both Savannah and New York. He also has created a series of hand drawn books detailing his meals at top restaurants in New York. Greeley is a media savvy chef who has appeared on numerous television programs, including NBC’s TODAY Show, CBS’s Saturday Early Show, ABC News, Discovery’s The Party Planner with David Tutera, and Cooking Channel’s The Originals, on which he cooked with legendary Chef Emeril Lagasse. His recipes have appeared in Saveur magazine, Los Angeles Times and other publications. When he’s not cooking, Greeley can usually be found in his art studio painting, posting on his website (www.modernchef.com), or making skateboards in his garage in New Jersey.